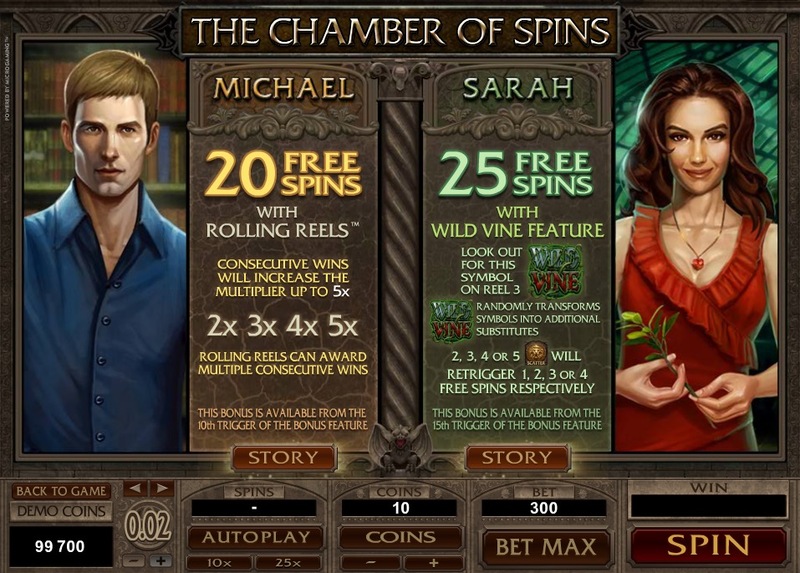 True love never dies, especially true love for online casino. 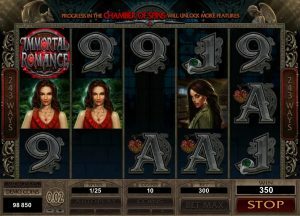 But with Immortal Romance, a slot game created by Microgaming back in 2011, things don’t have necessarily to get bloody. Launched at a time vampire series were all the rage, this casino slot game is not ready yet to bite the dust with its five spinning reels offering so many paths into temptation. Ready for some thrilling spins between love and death? 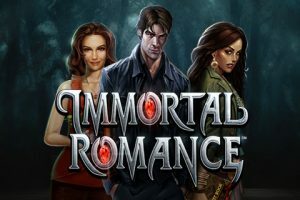 One of the reasons explaining the longevity of Immortal Romance comes with no doubt from the efforts put in the game narrative. Game designers have given it a real story behind each reel symbol character. 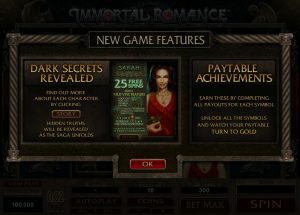 You’re made aware of this right from the start, with the feature ‘Dark Secret Revealed’ inviting you to uncover some hidden truths behind each hero while the game story unfolds. The intrigue is well supported by the graphic atmosphere, dark and mysterious as it should be. With enigmatic statues, gothic writings, the adequate use of brown, red and silver in the colour palette, plus 4 attractive males and females to play with – or against? 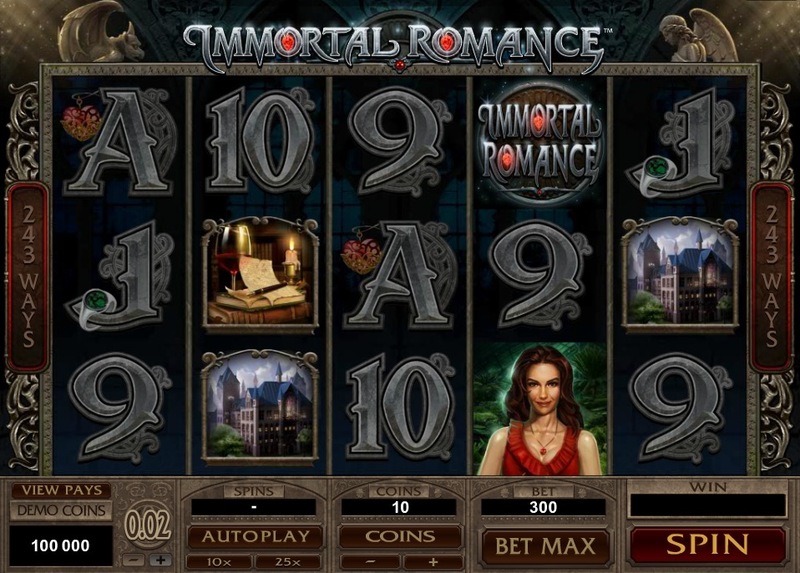 -, Immortal Romance quickly succeeds in placing your mind and heart under tension. This gets even better when you start spinning, thanks to the game epic, real soundtrack. With immersive melancholic space piano notes, sudden orchestral attacks at gain events, inspiring medieval anthems enhanced with melodic death metal-like guitars and keyboards, Immortal Romance hits you here with a full blood musical experience that reaches perfection. 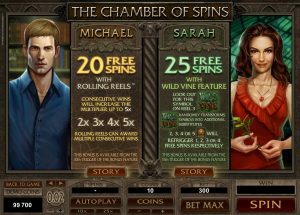 With such an ambience to let your spirit reach out to other states of life, playing for real almost become secondary, but then the game attracts you back into the darkened circles of our world, invoking your obscure desires for monetary profit with a couple of striking winning features. 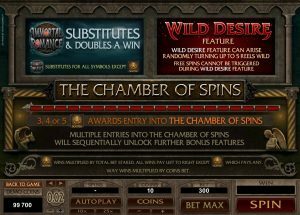 The Wild Desire feature for instance will appear randomly and turn up up to 5 reels wild. 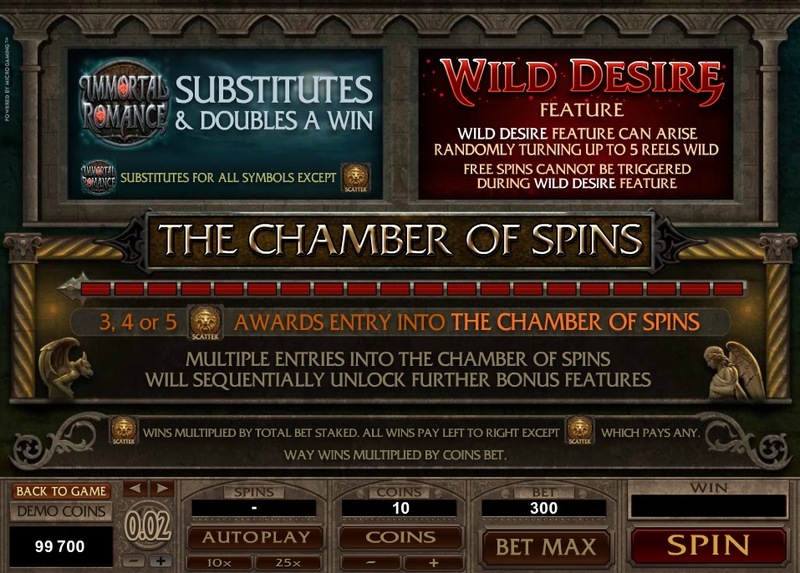 On top of procuring solid gains, the scatter gold doorknob symbol will activate the chamber of spins, where you will join one of the four characters in an 10 to 25 free spins orgia. 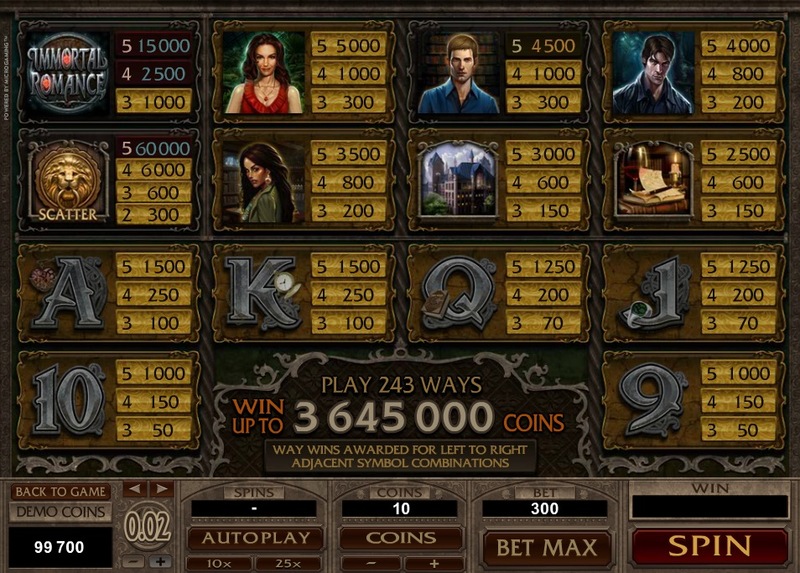 Completing all payouts for each symbol will also unlock the Payable Achievements and turn your pay table into gold. 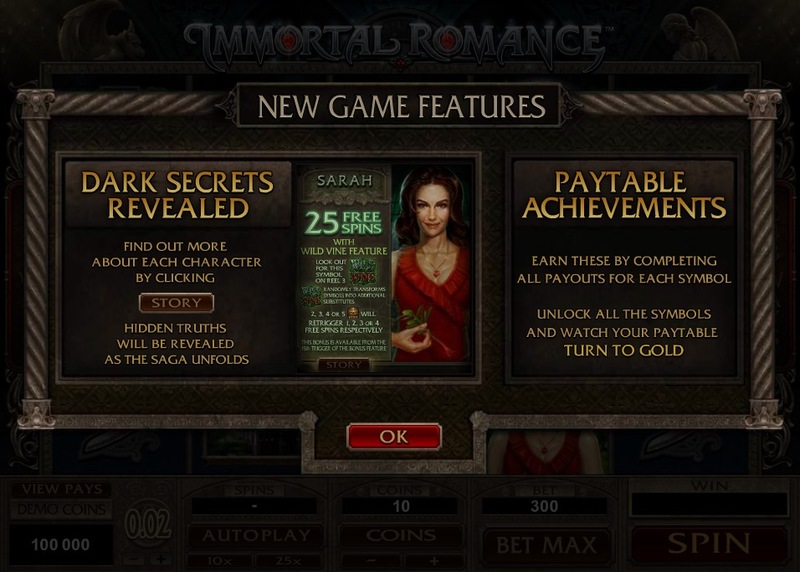 All this and many others features provide Immortal Romance with 243 manners to win; a very unique way to make you realize that in this world like in others, fate, lust and casino earnings work in mysterious ways. 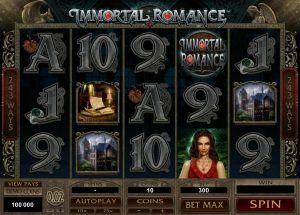 Thanks to a fantastically well drawn universe you can only jump into, and strongly addictive wins, Immortal Romance has truly earned an eternal spot in the history of slot games. 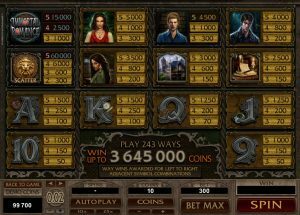 Nowadays you can still encounter the game at places like Guts casino, Red casino or River Belle casino, many years after its arrival on Earth. It could be that Immortal Romance was set to prey forever upon us, mere players, leaving us absorbed by an alluring vertigo of gain and loss across myth and reality, a vertigo we all know too well isn’t it?